MK1 Manufacturing has been making rack mount accessory kits for Apple Mac Mini and Mac Pro servers since 2007. 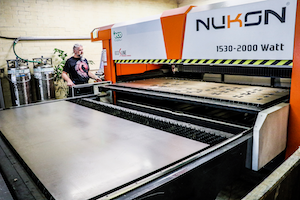 All of MK1 Manufacturing products are laser cut steel that is precision formed using the latest in CNC equipment. 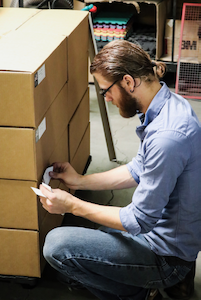 We use a “just in time” manufacturing philosophy that allows us to fulfill small and large orders on demand. Small orders are same day turnaround, larger orders of 20 units or more can be fulfilled within a few days. Here is a basic overview of our process for Mac mini and Mac Pro Server brackets. 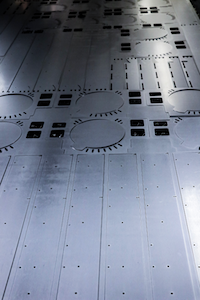 Our Fiber Laser represents the latest in precision metal cutting technology. 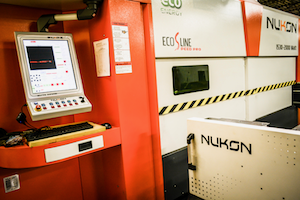 With high speed cutting (As high as 25000mm/min and accurate to within 0.02mm, our laser has the ability to feed our manufacturing process 24/7. Once the sheets exit this process every hole and every mark has been applied to the base sheet stock. 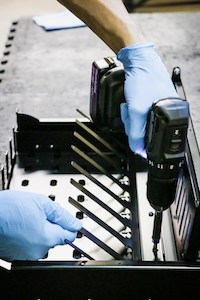 There are several advantages of laser cutting the rack mounts. The edges are smooth and finished, rather than the sharp and rough edges from metal stamping. This gives us a superior fit and finish that definitely shows in the final product. Since the products are cut on demand, we can process multiple parts at the same time without time consuming tooling changes. The software used to nest each production run creates a high density of parts per sheet, with only a few mm between parts. This minimizes waste and cost as well as maximizing output and efficiency. 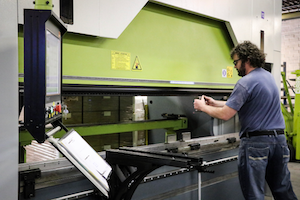 With our “just in time” manufacturing model we are able to take parts from the initial cutting process directly into bending operations. This allows for some parts in the same production run to be heading to forming while other parts are still being cut. Formed with our CNC brake press, we can get each unit ready for finish with a minimum of handling with back gauges that move with each step. Once each part is cleaned we move into final powder coat finish. 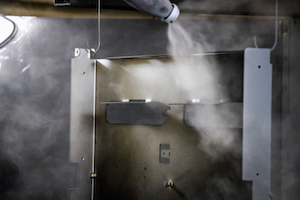 Powder coating is a fast, efficient and environmentally friendly way to apply an advanced decorative and protective finish to our rack mount products. We manufactured our dust collection and oven in house for high speed turnaround of a concurrent mix of products. This allows for minimal turnaround time. 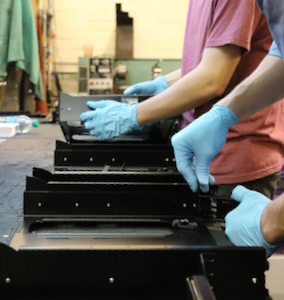 As the components move from the oven they are rapidly cooled and fed directly into assembly. This minimizes storage, prep and space requirements. Each component comes together the same day into the final product, ready for the customer once it exits the assembly line. If additional options are selected they are installed at this phase of assembly. A Mac mini or Mac Pro is placed into each product to check for alignment and function of every option such as USB and switch mechanisms. This rapid progress through our unique manufacturing concept allows us to process large and small demands as well as custom products. The fast turnaround allows for same day shipping on many orders placed before 10:00 AM MST time. Orders that begin the day as raw sheet metal frequently make their way to final product within a few hours.